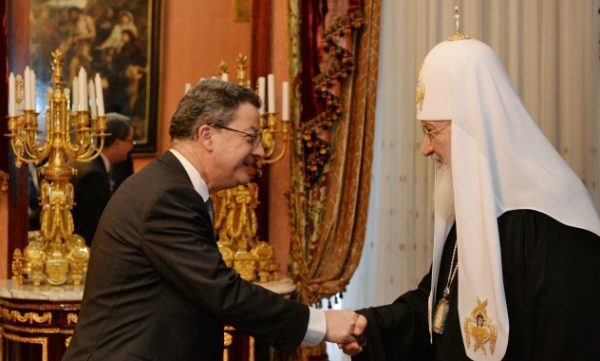 His Holiness Patriarch Kirill of Moscow and All Russia met with Switzerland’s Ambassador Extraordinary and Plenipotentiary to Russia, Mr. Yves Rossier. They were joined in their talk by Archimandrite Philaret (Bulekov), vice-chairman of the Moscow Patriarchate department for external church relations. Addressing the guest, the Primate of the Russian Orthodox Church stressed, ‘I have a special attitude to Switzerland because I lived in that country for a few years being the Moscow Patriarchate representative to the World Council of Churches. I had an opportunity for travelling around Switzerland and coming to know well the life of your people’. His Holiness shared his personal remembrances of people he happened to meet in those years. ‘I still have many friends in your country’, he said. During the talk the sides discussed matters of mutual concern.